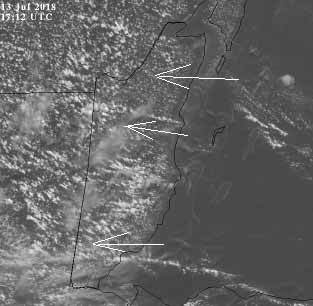 Belize NMS: Moderate easterly airflow prevails with mainly fair weather today. 24-hour forecast: Mostly sunny today and partly cloudy tonight with only isolated showers, and the chance of an isolated thunderstorm inland this afternoon and in the south tonight. General Outlook: (Sat & Sat night) Continung mainly fair weather with only isolated showers. 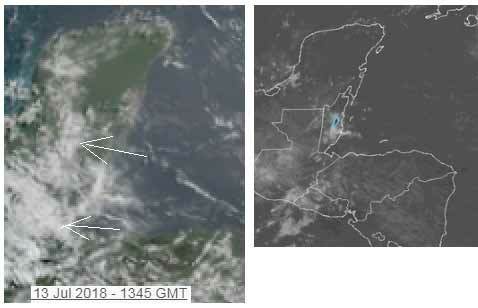 Today E 10-20 kts Moderate 4-5 ft ONLY ISOLATED SHOWERS. Tonight E 10-20 kts Moderate 4-5 ft ISOLATED SHOWERS AND THE CHANCE OF A THUNDERSTORM OVER THE SOUTH. Tomorrow E 10-20 kts Choppy-Moderate 3-5 ft ONLY ISOLATED SHOWERS. Outlook E 10-20 kts Choppy-Moderate 3-5 ft (SAT NIGHT) ISOLATED SHOWERS CHANCE OF ISOLATED THUNDERSTORM SOUTH. There are gale- force winds off the coast of Colombia. An upper level trough passes through the Mona Passage, toward the coast of northern Colombia. The trough is connected to the Atlantic Ocean 32N58W 23N62W trough. The monsoon trough extends from Colombia near 10N74W, through Panama along 80W, beyond NW Costa Rica. isolated moderate rainshowers are from 11N southward from 80W westward. Westward-moving tropical waves are lined up in a series, from 35W in the Atlantic Ocean into the eastern Caribbean Sea. The waves will pass across the region quickly through Tuesday. High pressure will build across the region behind each passing tropical wave, in order to freshen the trade winds in the central Caribbean Sea waters. The winds will pulse to strong-to-near gale force each night off Colombia through Tuesday, except to minimal gale-force tonight and on Friday night. Massive amounts of swellups happened yesterday, mainly up across the Yucatan and into southern Mexico, but they have all died down now. 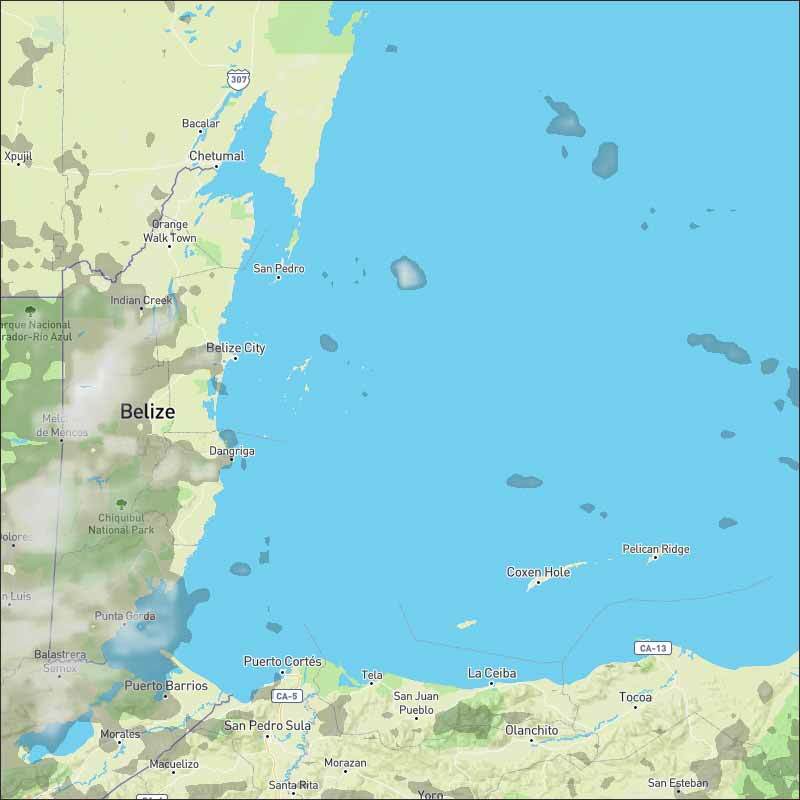 There is the regular easterly lies of Caribbean cloud coming in and a little mid-level cloud over part of central Belize, but no detectable rain anywhere in Belize at present. But the Sahara dust is back over our area. Looks like today will be cloudy and sunny, with a chance of some rain this afternoon. You can see the Sahara dust in the below picture, and you can see a very large area rotating weather in the Atlantic, moving our way, yet the weather people make no comment about it. OK it is very large and has been developing over the last 3 - 4 days, but is unlikely to develop into a Tropical Storm, but it should be watched.